Moab is seeing a renaissance in trail building. 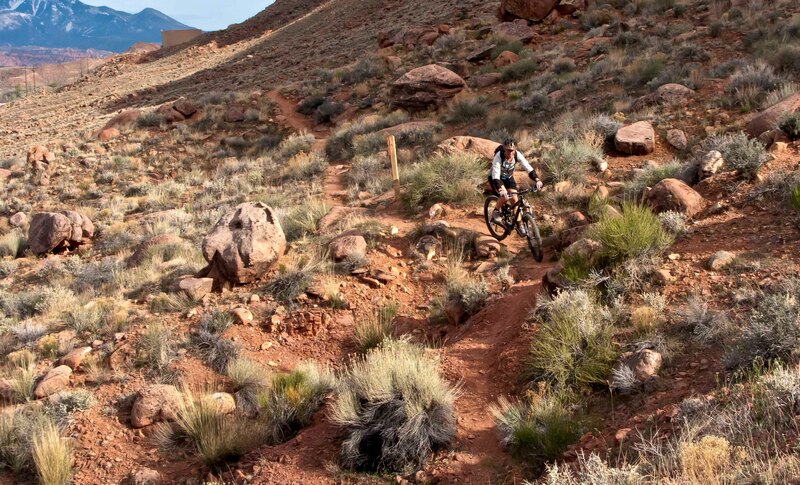 For years, the mountain biking trail inventory in this Eastern Utah Mecca was static. 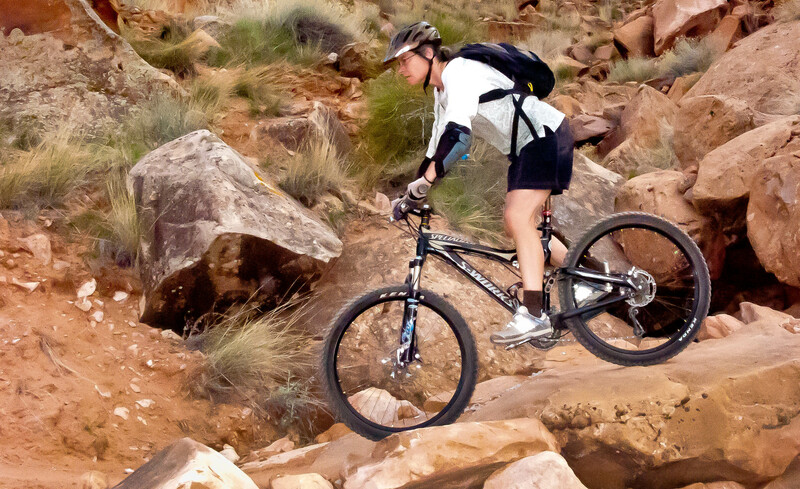 Historic sandy Jeep roads defined the area’s mountain biking trails. This is changing. 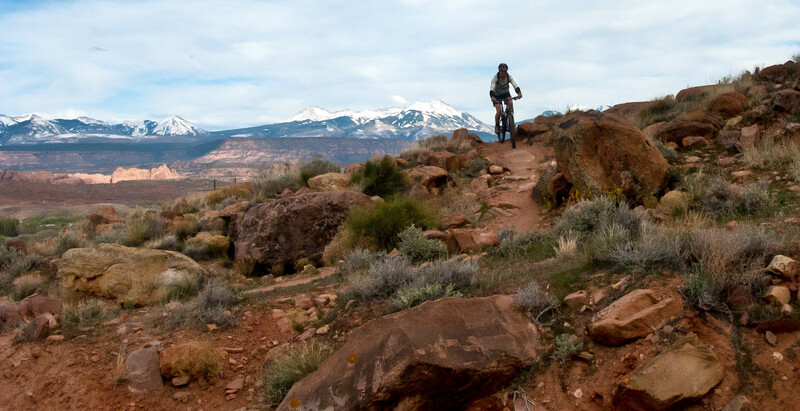 Significant singletrack trail additions, most notably in the Sovereign, Bar M, and Porcupine Rim areas, have opened up many new excellent trail options. 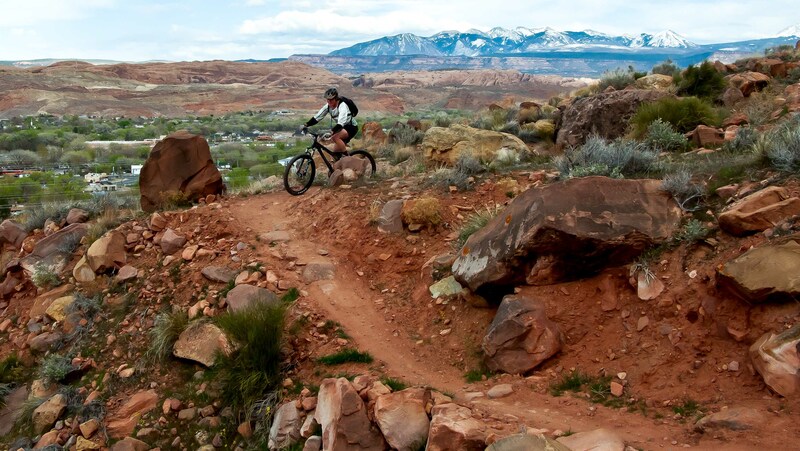 There’s even a new set of trails near scenic Dead Horse Point State Park. 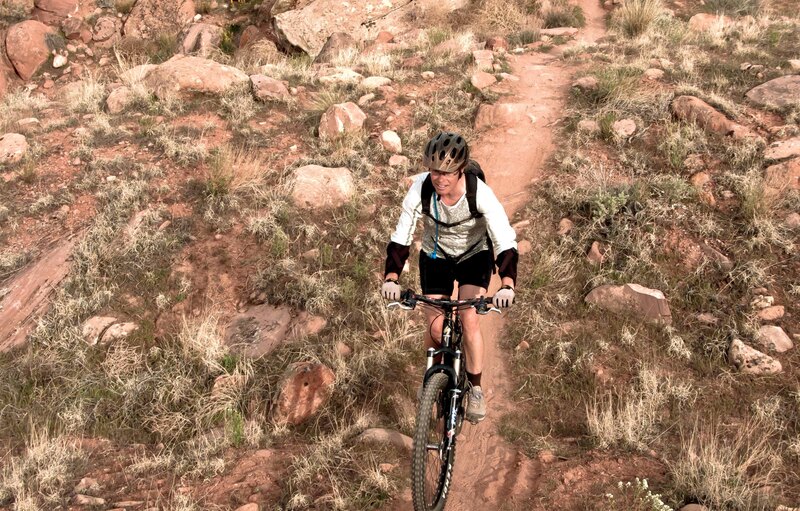 Another area where there’s new stuff to be ridden in Moab is the ubiquitous utility corridor. The power and pipeline swath sits near the hills on the southwest side of town. Here lies a new trail, Pipe Dream. We learned of Pipe Dream on a visit to the Chili Pepper bike shop. The trail sits on the shoulder of Moab’s western hills. It can be accessed at many points from the neighborhoods. We reached the trail with a short climb of an old Jeep road off of Doc Allen Drive. When the Jeep track crossed Pipe Dream we arbitrarily turned right onto the singeltrack trail. It didn’t matter which direction we turned. Pipe Dream can be ridden in both directions. Pipe Dream fits squarely within the modern style of mountain biking trail building. Indeed, professional trail builders Jeff Fink and Scott Escott are responsible for the design. All around the world a new generation of trail architects make challenging singletrack to the stable IMBA standard. Gone are the fall line trail disasters and the virtually paved four-foot wide multi-use super highways. Grade reversals and rock tread armoring are characteristic of the new trail doctrine. The new trails, like Pipe Dream, are stable, challenging, and dead on fun to ride. It took a major effort to build Pipe Dream. The tread sits in a rocky area with plenty of side slope. Benching a trail in these conditions cannot have been easy. Add in the rockwork and the effort seems enormous. From the saddle of the bike the result is worth it. Pipe Dream is a blast to ride. Challenging and tricky rock sections are linked by a meandering hillside tread. And always there’s a reminder of the punishing exposure off of the downhill side of the trail. Currently Pipe Dream consists of about 5 miles of tread. This is sure to change as the trail building continues. The goal is to create continuous corridor of singletrack with several loop options. Some of the lower and easier trail is already in place. When everything is completed, covering this trail system should make for a good day of riding. Even now, ten miles of out and return on slow and tricky Pipe Dream makes for a significant effort. 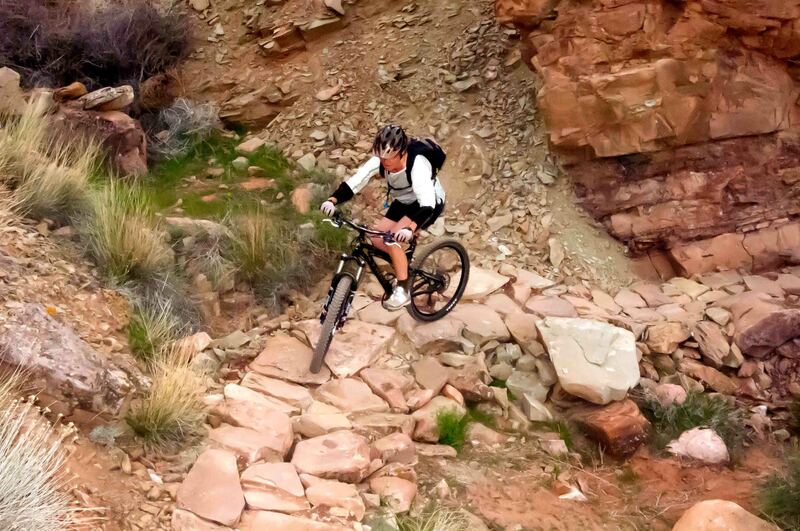 One thing assures that Pipe Dream will be a popular Moab trail option. It’s in town. You can leave your car behind. 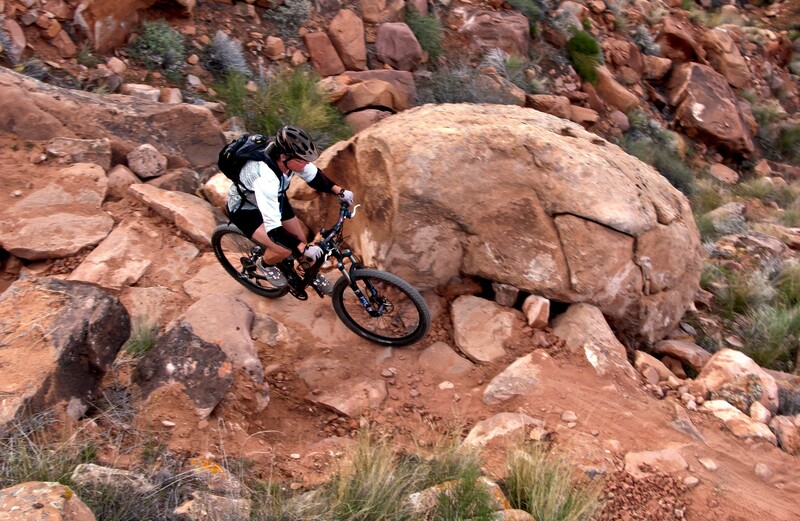 Moab has never been much on non-epic ride-in ride-out trail riding. Pipe Dream is an excellent start in this direction. For those wanting a short riding day this new trail will be a top choice. Besides, you can park your bike in front of a brew pup at the end of a ride. You can’t beat that. 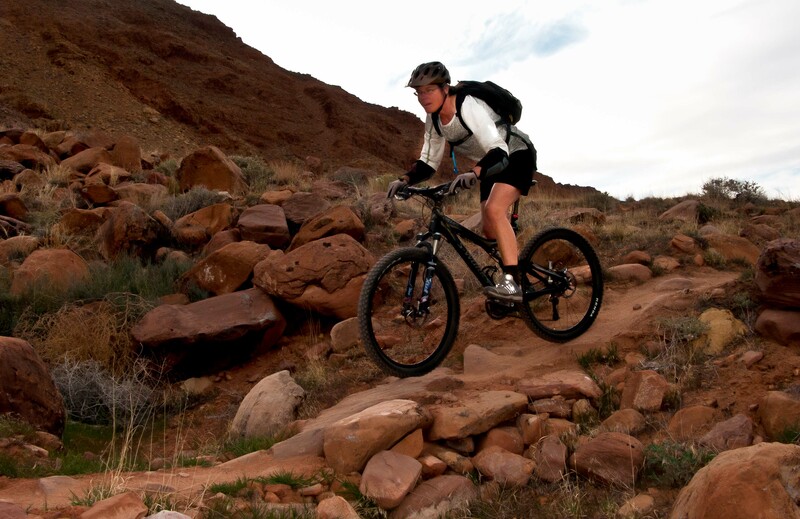 Now you can visit Moab and expect to find new trails. The capitol of old school destination mountain biking is getting fresh track additions. New school meets old school and the good gets better. This popular place on Moab’s old main drag offers excellent burgers, both beef and buffalo, along with fresh cut French fries and tasty shakes. 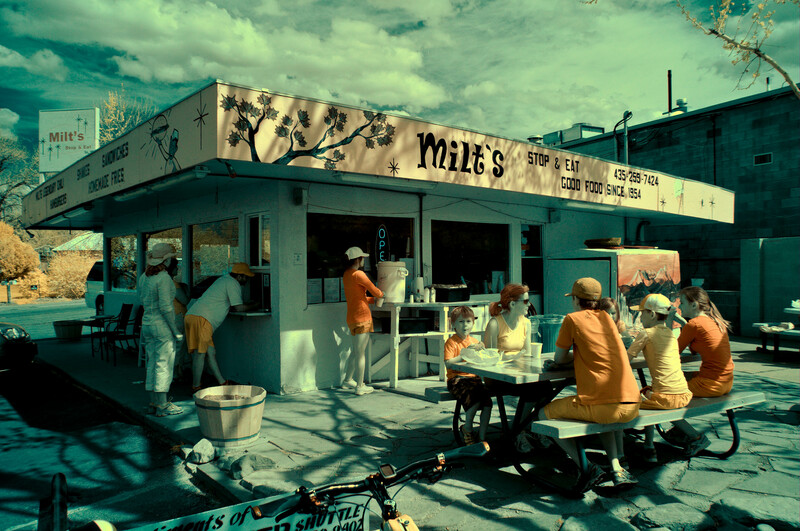 With an outdoor eating area, it is perfect for a post ride meal. 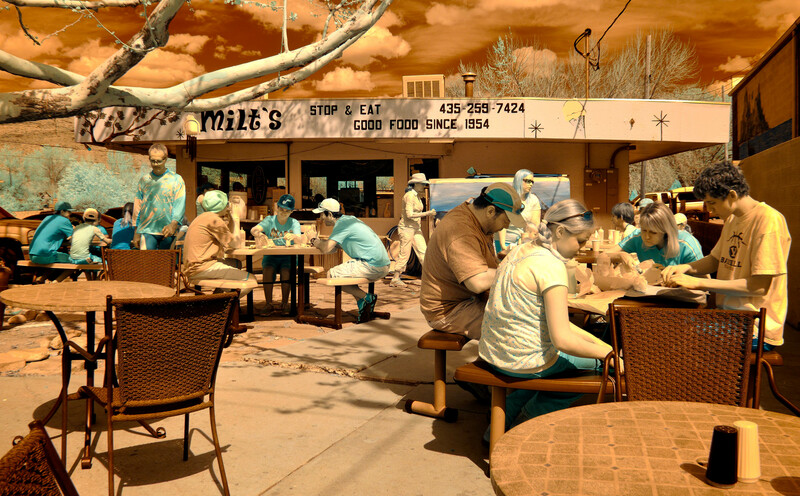 Milt’s is located at the bottom of the road up to Slickrock Trail.